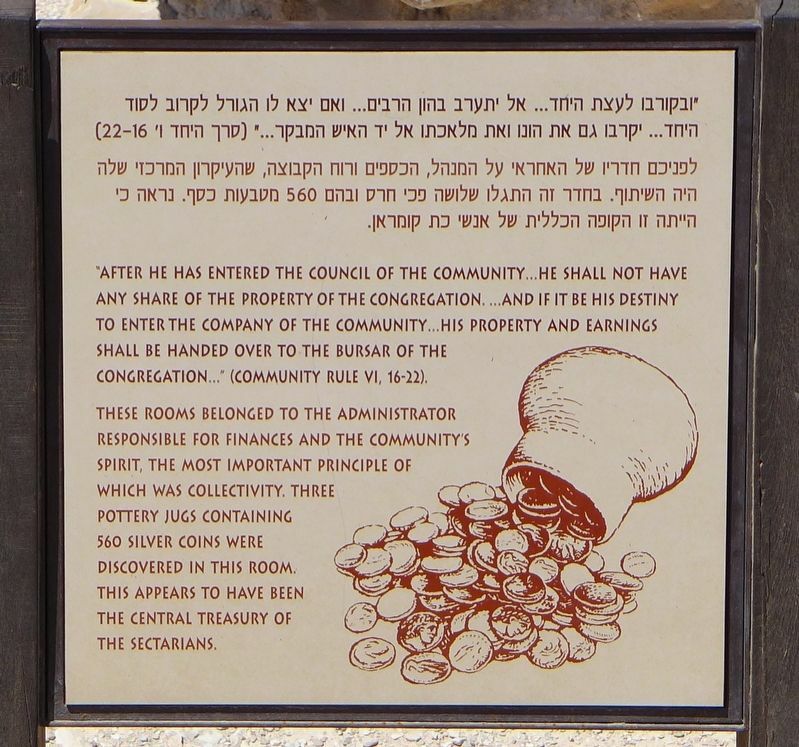 "After he has entered the council of the community ... he shall not have any share of the property of the congregation ... and if it be his destiny to enter the company of the community ... his property and earnings shall be handed over to the bursar of the congregation ..." (Community Rule VI, 16-22). These rooms belonged to the administrator responsible for finances and the community's spirit, the most important principle of which was collectivity. Three pottery jugs containing 560 silver coins were discovered in this room. This appears to have been the central treasury of the sectarians. Location. 31° 44.476′ N, 35° 27.553′ E. Marker is near Kalya, West Bank, in Megilot Council. Marker can be reached from National Route 90 9 kilometers south of National Route 1, on the right when traveling south. Touch for map. 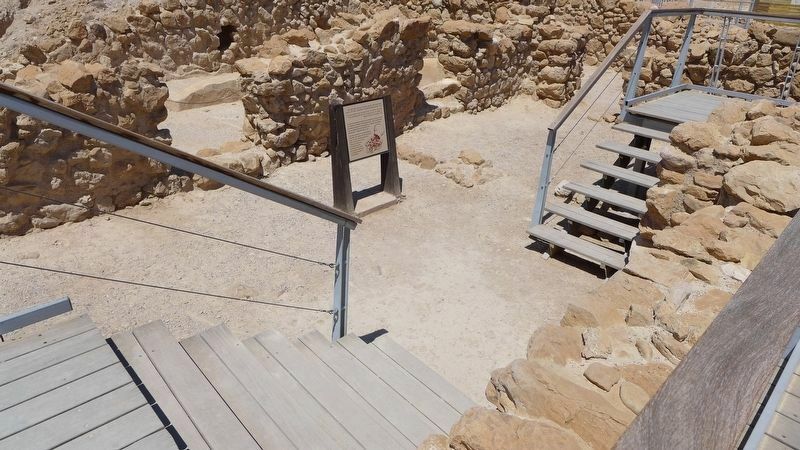 Located near Highway 90 and about 1 kilometer from the western shores of the Dead Sea, in an archaeological site in the West Bank managed by Israel's Qumran National Park. Touch for directions. 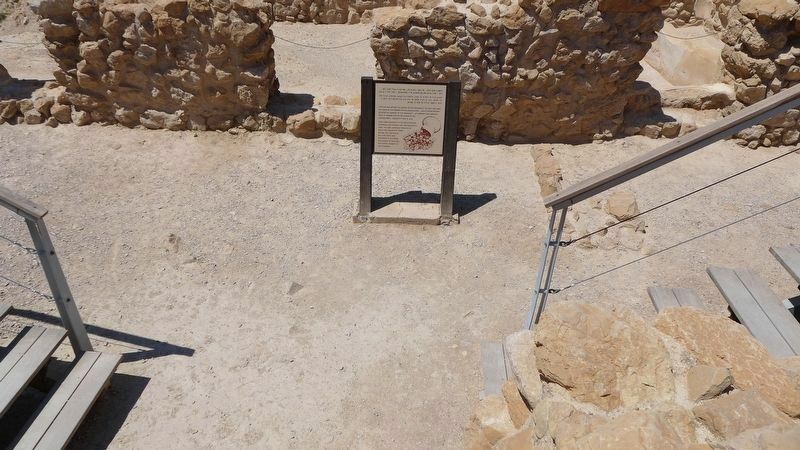 Distant view of the marker in the ruins of Qumran. few steps from this marker); Pottery Storeroom (a few steps from this marker); Kitchen (within shouting distance of this marker); Ritual Bath (within shouting distance of this marker); Work Area (within shouting distance of this marker); The Scrolls Cave (about 120 meters away, measured in a direct line); Paran Monastery (approx. 17.8 kilometers away). Touch for a list and map of all markers in Kalya. Another distant view of the marker in the ruins of Qumran. More. Search the internet for The Bursar of the Congregation. Credits. This page was last revised on April 18, 2019. This page originally submitted on April 15, 2019, by Dale K. Benington of Toledo, Ohio. This page has been viewed 28 times since then. Photos: 1, 2, 3. submitted on April 15, 2019, by Dale K. Benington of Toledo, Ohio.